Newsmax is now offering "Mount Rushmore America" — a beautiful lithograph of one of the great icons of our nation, the Mount Rushmore National Memorial. This Memorial is complete with 60-foot granite sculptures of four former presidents representing the first 150 years of U.S. history. 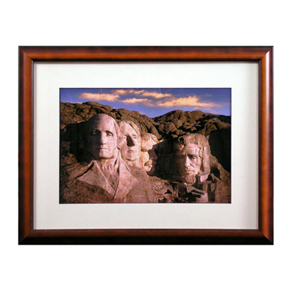 In honor of this beloved landmark, our offering of this high-quality lithographic print "Mount Rushmore America" shows the images of George Washington, Thomas Jefferson, Theodore Roosevelt and Abraham Lincoln in all their sun-washed glory. The 16 inch by 20½ inch frame, with a warm, two-tone pecan finish and a fine white mat, perfectly compliments the stirring full-color image. South Dakota state historian Doane Robinson conceived the idea for Mount Rushmore in 1923, and he persuaded sculptor Gutzon Borglum to take on the monumental task of carving the four presidents into the side of a mountain near Keystone, S.D. He chose the location of the work because it faced the Southeast and enjoyed maximum exposure to the sun. Congress authorized the Mount Rushmore National Memorial Commission on March 3, 1925, during the Calvin Coolidge administration. Borglum began the project, along with nearly 400 workers, on Oct. 4, 1927, and continued his labors until he died in 1941. His son Lincoln Borglum carried on the project until Oct. 31, 1941, and became the National Memorial's first superintendent. Despite the vast scale of the project and the inherent dangers, no workers were killed during the 14 years of sculpting. Today Mount Rushmore is the No. 1 tourist attraction in South Dakota, with more than 2 million visitors traveling to the Memorial each year. This fine print depicts the world's largest piece of sculpture — and four American heroes — and comes ready to hang in your home or office, and makes a perfect gift of enduring value.